The adventure of Jordi and Joana around Africa has allowed us to know firsthand some of the projects we have funded and the impact they have had. Some days ago, we talked about the social use of the bicycle and today we prove it. After visiting the rural school which we collaborated with some months ago with the NGO Active Africa in Tumm (Kenia) – you can remember the project HERE – our two ambassadors continued their adventures around Africa towards Patongo, Uganda. Patongo is a rural area in the North of the country that still suffers the consequences of two decades of conflicts between the government and the army. As a result, many children were orphaned, and today, most of them live in groups under the tutelage of some adults in the community. The oldest girl of the small group is the one who cares about the day-to-day. She takes care of cooking, taking care of her siblings and maintaining the family garden while her siblings go to school. Most of them have had to drop out of school because schools are too far from home and don’t have time to combine work from home with school. In front of this situation, the local NGO Passion for Community, together with Chance for Childhood, started a project in order to distribute bicycles to orphaned girls so that the lack of time and travel to their school doesn’t imply an impediment to be able to continue their studies, to bring the vegetable surplus to the market more easily, to arrive to the doctor in time if any member of the family becomes ill … and, ultimately, take control of his own life. Here in Worldcoo we know firsthand this project because just a few months ago we helped to finance the distribution of 25 bicycles by Santa Fixie Group, one of the e-commerce that collaborate with us. You can remember the project HERE. 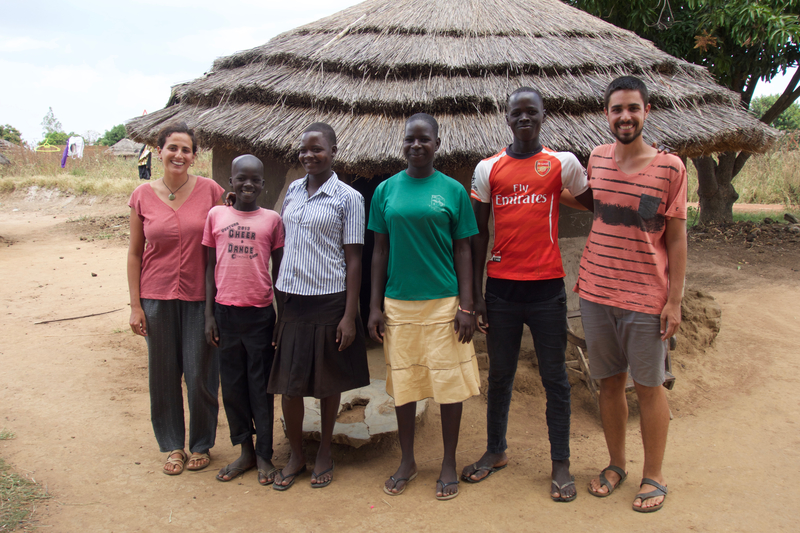 In Patongo, Jordi and Joana have had the opportunity to meet and talk with some of the teenagers who have been able to continue their studies as a result of this program. Here, there are some of them! Margaret Amono is the oldest sister of a group of 6 who, years ago, became orphans. Thought the bicycle she can now study hairdressing in Patongo. “I’m Margaret Amono. Before I got this bicycle I used to walk on foot to school and reached the school late. I didn’t concentrate very much on the lessons because I was feeling tired. 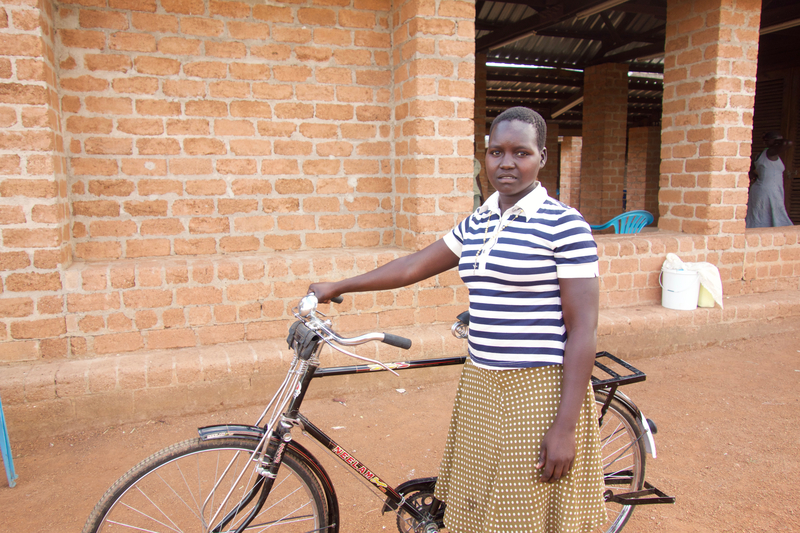 But now that I’ve received the bicycle, I am able to reach the school early enough. I reach when I’m fresh and I have time to concentrate. This bicycle is as well helping me carry food items from the garden and bring it home. Others, it’s also helping me like when one of my siblings is sick, I take him or her to the hospital with the bicycle. I’m also able to reach the market. So, I’m saying thank you so, so much because the bicycle is helping me a lot”. “ I’m Atto Scovia. I’m 16 years old. The bicycle I was given in July, so it’s roughly 5 months now. So the bicycle is helping me for transport because I come from a far sub-county from this place. I normally travel with another young one who comes and gets back with the bicycle to keeps on helping them from home. The bicycle is also helping us to fetch water because from our place, the drinking water source of very far away. 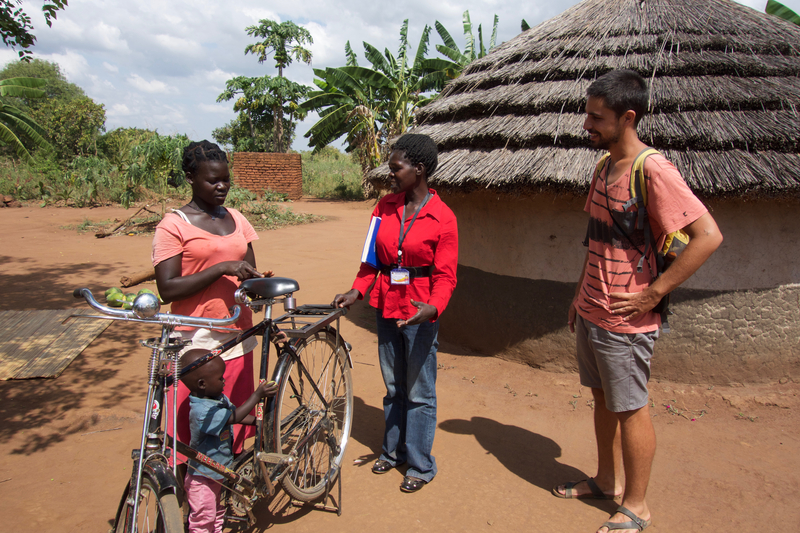 We also use the bicycle to get to the market to sell some of the food products that we harvested and to carry other food crops from the garden”. Jordi, Joana, thank you very much for giving us your impressions and visiting this project so special for us. It has been a pleasure. The truth is that when we think about volunteering in countries like Uganda, we always come to mind the great name of the most famous organizations that have been in these countries for so many years (UNICEF, UNHCR …). It was very interesting to see and verify that a local organization and another not so well-known have been able to mount this whole project and put it into practice satisfactorily. What a great job! Often, from home, there is the uncertainty of whether the help we can send from here is appropriate and if they reach their destination. That is why it is important to have confidence in the project or in the entity in which you donate support. The projects we have visited optimize and take advantage of every help they receive and that, to us, makes us continue to believe in collaboration between people.